Sadly, bats are one of the animals most frequently found dead near wind turbines. New research into the cause of death has discovered that it is not just flying into the massive blades that kills the animals, as conservationists have previously thought. The instant huge change in air flow pressure caused by the propellers movement creates problems akin to the “bends” that divers receive if the pressure change is too great on surfacing. 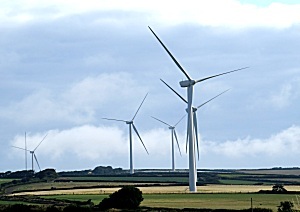 Researchers at Queens University, Belfast said pressure changes caused by the revolving turbine blades leads to this phenomena and named the affect “barotrauma”. Some think it should be named “batotrauma” as the sudden pressure change tends to affect bats disproportionately to other birds. Bats are, of course, “flying mice” and mammals rather than birds, so perhaps that physiological difference makes them more susceptible. Bats in the UK are a protected species under the Wildlife and Countryside Act 1981 and Dr Richard Holland has recommended that wind turbines be turned off in areas of high migration when the bats are on the move. With turbines already notoriously inefficient, this is unlikely to be welcomed by energy companies and pro-turbine stakeholders. The team at Queen’s University Belfast also established that migratory bats use polarised light to navigate once above about 50m altitude on long journeys and set their internal navigation compasses in accordance with polarised light at Sunset.